On Sunday, I went to an improvisation gig by a jazz quartet at a venue in East London. Five minutes in, I was thinking that I should have read the blip more carefully, though a second reading confirmed my initial reaction, which was entirely one of puzzlement, which later turned into annoyance, and ended in a profound disappointment something akin to anger at a wasted opportunity. Each musician on the stage was incredibly skilled in his or her own right, and several had collaborated for years, in some cases decades. The two newest members were, judging by their bios, widely experienced in creative improvisation and collaboration. So why was I puzzled? Because what I saw was only a ‘collaboration’ in the broadest sense that they were all on the stage together. In its most basic form, collaboration simply means ‘to work together to produce something’. As a classical musician, and indeed in my forays into jazz, folk and bluegrass, I do this all the time with colleagues. We have a go, compare notes: what went well, what we could do differently, what could be improved. The rigorous Western classical music tradition involves a great deal of self-reflection and post-performance analysis, and as being a lyric soprano of my stripe often involves its own versions of tight-rope walking, vocal gymnastics (occasionally vocal contortionism) and feats of physical endurance and strength, there is always something which could have gone better. In a sense, it is as taxing as any Olympic sport; if you doubt it, try singing a big aria full-tilt for an audition and taking your pulse afterwards, and reflecting on both the physical and mental energy expended, which is somewhat astonishing. It certainly requires a seemingly effortless mastery of instrument, performing traditions and musical history, all brought to bear with a (supposedly) perfect balance of passion and restraint in the moment of performance. In improvisation, of course, much of this gets thrown out of the window, which is both exhilarating and terrifying. There are no ‘dots’ to interpret or hide behind, just your own inventiveness, all those skills torn away from most of one’s known frameworks and turned to new ends. Oh the freedom, away from the tyranny of the score! Of course, each time you do an improvisation, you discover a little more of what ‘works’, what serves to provide inspiration and momentum for yourself and others to craft a satisfying ‘shape’ to an improvisation, both for you and the audience. And you file it away in the memory, ‘mapping’ it so that future improvisations are referring to that performance—even if subconsciously—and drawing from it in some fashion, much as one can criss-cross a well-known park in similar but rarely identical patterns. Each journey is different, partially because you’re in different company. The other joy of improvisation is working together with the people you’re with at that moment. I vividly recall the moment I first understood this, in a workshop in the Piano Gallery at the Royal Academy of Music, when violinist Pedro Meireles looked at me across the ensemble and, eyebrow cocked, wordlessly dared me to ‘come and play’, to engage musically with what he was doing, bouncing off and building on what he gave me. I did so, and the result was musical magic, as though gravity had disappeared, for I was taken beyond my own constraints into musical relationship. To me, this is the real heart of improvisation: rendering into sound, sounding forth the spontaneous interpersonal interactions which make up the stuff of daily life. This is what I did not see on that stage, and I mourned for its absence. I tried hard to see how the musicians were listening to one another, opening spaces for each musician to exposit, develop ideas, bounce off one another in that beautiful sonic dance I’ve seen occur which is so organic and captivating and unrepeatable. I failed. What I heard was four great musicians essentially doing their own thing, more or less at the same time, with seemingly little reference to the others. The result was unremittingly complex, and though there is absolutely nothing wrong with complexity, and there is truth to the statement one audience member made in the interval that it reflects the realities of our modern society, I would argue that simplicity, self-restraint, and silence are just as valid, intrinsic and necessary as reflections of human nature. The truth was that after three pieces without any (to me) discernible shape, with lots of jagged, complex rhythms layered top on top and lots of intriguing effects being coaxed from instruments (especially by the string players) which to my sadness, I could barely hear over the more dominant sax and piano, I was utterly exhausted. There was lots of good and interesting music happening, but all at once, so I couldn’t have picked one line’s eloquence out if I’d tried (and I did). There was no rest. There was no moment of visible pleasure in the skill of their colleagues, allowing that player’s musical wit or whimsy to flow for more than one phrase, uninterrupted, rising and falling across the full arc of musical thought, before piling in with more detail and commentary which obscured rather than complemented. They were listening intently, but to something I certainly didn’t hear or sense and whose end I could not trace in what followed. All in all, it struck me as curiously self-absorbed playing, the impression somewhat akin to my experience of attempting, in a recording studio, to sing or play a line over already-recorded tracks played through headphones, with a click-track slightly too fast for comfort, driving them on with relentless, even pitiless insistence. I’m sure that was neither their intent nor their experience, and perhaps I was alone in that impression. There was also no consonance—indeed, there was a marked determination, in proper Schoenberg-ian fashion, to avoid anything that smacked of a chord or a cadence; this would, I think, have been considered far too ‘obvious’. As a life-long champion of obscure music and the ‘underdog’, I am no stranger to the ‘road less travelled’, and I often admire it. I have sung a fair bit of contemporary music by now, and I have come to appreciate much more of it, though I still stick to my theory that these days, much composition is only one part music, the other two parts consisting of philosophy or aesthetics and psychology. The experience of the listener has become either a matter of utter inconsequence (the primary focus of the exercise being self-expression by the composers or, in this case, the performers) or a means of almost clinical experimentation and observation as to how the given sonic experiment affects the listeners. As far as I can see, the idea of music as existing for and with people, as being created within a communal space and expressing a truth outside of any one individual, has fallen decidedly out of favour, at least within the rarefied atmosphere of contemporary classical music—and by this token, some experimental jazz. But I am still allowed to have my preferences. So I feel absolutely no shame in saying that in my view, sometimes obvious is beautiful! More than that, much of what is good and right and true can appear obvious from the ‘right’ angle, and equally, obscurity and complexity can be elevated to such a position of virtue that it ceases to matter whether or not the work is, itself, good or right or true, even if it is technically accomplished. That said, snobbery is a weed that flourishes on both sides of the aesthetic divide. I still ascribe to the ancient Greeks’ idea that a well-tuned chord ought to shift something within the physical world, that music should move us. We speak of things ‘leaving us cold’, but what, then, ‘warms us’? Is not warmth and life a condition to which we should aspire? Some of the most moving works that I’ve heard and sung move between these worlds of consonance and dissonance, between complexity and simplicity, beauty and ugliness, approachability and opacity. In my experience, this mixture also makes for the best and most satisfying improvisations, as they are essentially ephemeral and not available to posterity for close study as are composed works: all we have is the impression we can gain as the moment passes. Perhaps, as a sheer ‘exploration of occasion’, what I heard on Sunday was as valid as anything as an expression of a certain aesthetic or worldview. But for me, at least, it wasn’t the least bit satisfying. In fact, in the telling British phrase, it rather left me ‘losing the will to live’. In fact, in a rare act of artistic desperation, I deserted the scene after the first set, feeling I simply couldn’t sustain any more of that particular sort of intensified aesthetic exploration. Why did this experience provoke me, a usually sanguine person, to genuine anger? Because with all the skill and depth on that stage, we could have received something so much more interesting—if less complex—than what transpired. We could have seen something full of grace, flexibility, time taken and ego put aside to serve fellow players, to explore what they might construct as a team. There were about three moments (perhaps one per piece, perhaps two) when I remember thinking—‘ah, this is interesting! Now it will evolve into something new!’ But it didn’t. Once again, the avante-garde became derivative in its rigid determination to BE DIFFERENT AND NEW. 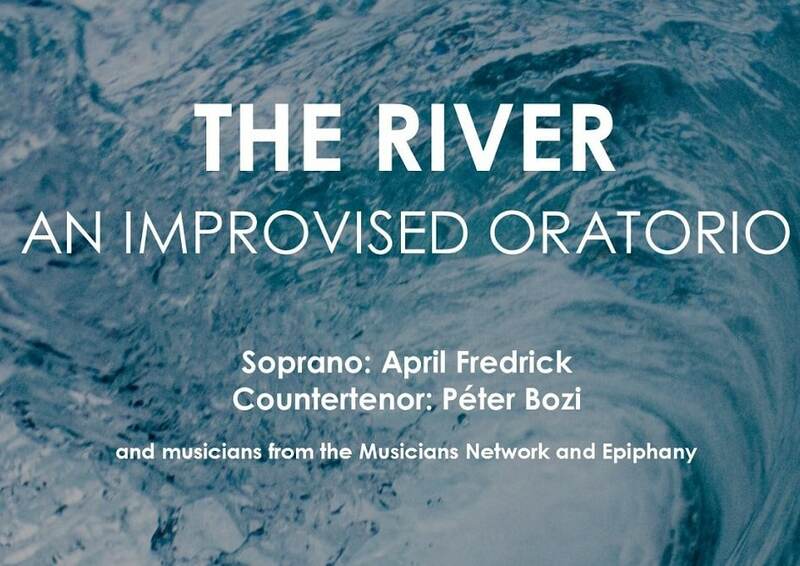 I suppose all of this is close to the bone right now because I am currently up to my neck in a rather different—and equally risky—experiment of improvisation: an improvised oratorio called The River, with countertenor Péter Bozi and about 20 musicians from Epiphany and the Musicians Network. In fact, you might say it is the polar opposite, ‘a journey from the beginning of time to future hope’. As far as we know, nothing of this scale, with multiple interlinked movements and performing forces on this scale, has ever been attempted. The whole idea emerged from short improvisations I did with the group during our annual Vision Days, and the experience was sufficiently powerful and extraordinary, even for veteran orchestral musicians, that we felt we ought to investigate whether it could be expanded further. How shall I describe it? Like hearing a symphony emerge from nothingness around you, spontaneously, dark and joyous in turn, more organic than anything I’ve ever heard, and as to goosebumps—they were there aplenty! Cue a protracted and occasionally torturous process of trying, between four or five of us, to discern which elements, for a group this size, would need to be fixed to give some sense of structure, and which could and should be left to genuine and spontaneous invention. We wanted those who listen to be able to journey with us, so we had to wrestle with our collective suggestions and do our fair share of ‘killing our darlings’ in terms of setting aside pet ideas to serve the whole. So what we know is this: it will have seven movements, Beginning, Lament, Promise, Waiting, Incarnation, Redemption, and Home. The text, a combination of biblical and liturgical texts and original poetry written by me, will be more or less fixed, though we may not use of all of what we print and may introduce other elements if inspired to do so. We have decided upon certain ‘events’, largely instrumentation and basic textures to occur in response to text at given points, to provide a sense of shape and impetus. But there are no guarantees. It could all go ‘pear-shaped’ and badly wrong. And I’m okay with that. What makes it okay is the actual experience of improvisation itself in this context, with these particular people. I think that Jeremy Begbie once again lends us insight through his writings on how improvisation mirrors the dynamics of Christian community; indeed, I first encountered this idea through a talk at a Musicians Network Vision Day talk by my friend Keith Ford. Sometimes, when a train of musical thought dwindles, someone has to step up and introduce something new, and that does often entail a moment of dissonance in which the group has to wheel round and decide to take on and honour and build on the new idea. The final way that improvisation mirrors the life of a Christian is what Begbie calls ‘the interplay between order and non-order, the predictable and the unpredictable, the regular and the irregular’. (5) In a sense, this whole project takes that small-scale interplay we experience in a piece of music and writes it large, considers its application in the meta-narrative of the Christian faith across the arc of human history. Creation, fall, exile, redemption: is this not ‘order and non-order’ in its purest story form? I appreciate that for many, such ideas are deeply foreign, perhaps even deeply suspicious, at best disappointingly ‘obvious’. I can only say that my few experiences of improvisation with musicians of the first sort has been curiously flat, being blocked at every turn by strident peals of inscrutable though no doubt learned sound, feeling that my ideas, when I had the courage (or temerity) to offer them, were being trampled and not heard, leaving me to question the point of being there at all, a dynamic of which I rather suspect my fellow players were almost entirely oblivious. In stark contrast, my experience of improvisation with these Epiphany and Musicians Network colleagues, using improvisation as a means to rehearse and embody in sound and time the narrative and lived reality of redemption and loving community, has produced an experience so rich and moving and multi-hued that it has forever coloured my perception of what is possible. It is a musical journey which makes indifference impossible, or as an audience member at an Advent performance of my Baroque ensemble Dei Gratia explained about listening through The Messiah, ‘Every time I hear it, something shifts within me’. So if you come, what can I guarantee? There will be moments of complexity and simplicity, and we are doing our best to be courageous to be both ugly and beautiful, as life is both ugly and beautiful. Will it be ‘good’? Well, I suppose that will depend on what you come expecting (just as my experience on Sunday was very much shaped by my expectations). I believe it will surprise and move you. There will be moments of élan, of real buoyancy and brilliance and pathos. ‘Success’ will be very hard to define, but we welcome any and all to join us for this journey of the soul as well as the ears. 1. Kathleen Housley, ‘A Conversation with Jeremy Begbie’, https://www.imagejournal.org/article/a-conversation-with-jeremy-begbie/, accessed 25/4/2017. 2. Ivor Gurney, ‘The Mangel-bury’, ed George Walter, Everyman’s Poetry, Vol 13, J.M. Dent: London, 1996, p. 83. 3. K. Shackleford, ‘What Can Jazz Teach Us About Being a Christian’, https://www.allaboutjazz.com/jeremy-begbie-what-can-jazz-teach-us-about-being-a-christian-jeremy-begbie-by-k-shackelford.php, accessed 25/4/2017. 7. T.S. Eliot, ‘The Dry Salvages’, The Four Quartets, Faber & Faber: London, 1995, p. 28.